If Britain was to match US levels of productivity, our GDP would be boosted by 31% - equivalent to £21,000 a year for every household in the country. Susan Acland-Hood, Director of the Enterprise and Growth Unit, HM Treasury explains why productivity matters and how the Government plans to raise productivity and thus boost our economy by ‘Fixing the Foundations’. Productivity isn’t everything, but in the long run it is almost everything. When George Osborne returned to the Treasury in May, one of the first pieces of advice he asked for was a bold plan to boost productivity. We were keen to advantage of the unique opportunity presented by an incoming Chancellor keen to set out his stall, focused on the long-term and ready to take bold steps to tackle Britain’s long-standing productivity challenge. The plan – called ‘Fixing the Foundations’ – was launched in Budget week. 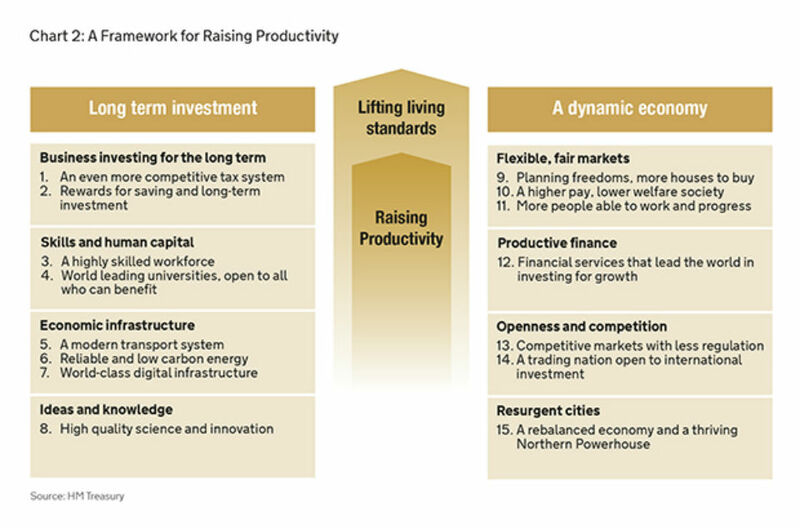 This article explains why productivity matters, how the Chancellor and the Treasury – working across Whitehall – developed the plan; and some of the key changes in it. Productivity growth really matters. It isn’t some obscure metric of interest only to economists or policy wonks, but is the driver of faster - and more sustainable - economic growth. If Britain was to match US levels of productivity, our GDP would be boosted by 31% - equivalent to £21,000 a year for every household in the country. Every OECD country with higher average wages than Britain also has higher productivity levels. So the stalling of productivity growth since the financial crisis matters to all of us and the revival of productivity is by no means a certainty. In their 2015 Economic and Fiscal Outlook, the Office for Budget Responsibility (OBR) stated in their forecast that productivity growth will pick up slowly to more normal rates. It was critical to make this a ‘Parliament of productivity’ and to set out strong proposals for an incoming Government. That meant building a well-founded and common understanding inside the Treasury about which measures really mattered. 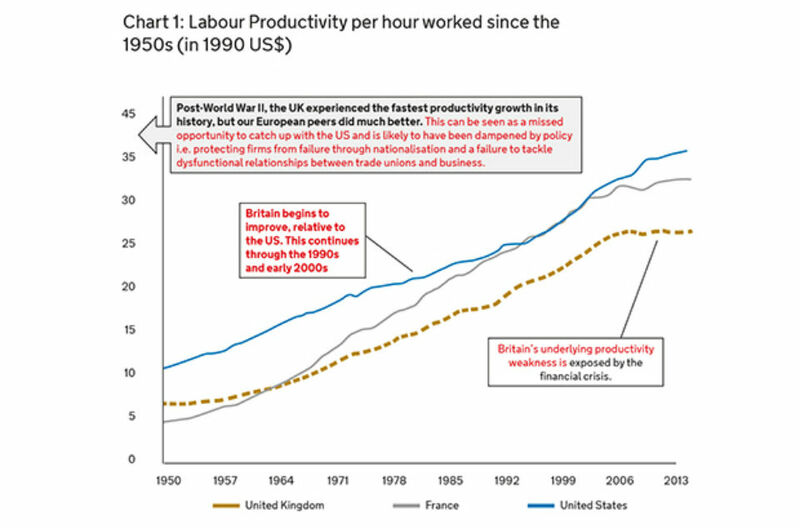 In Britain, productivity has increased more than seven-fold over the last 100 years, with huge benefits to wages, living standards and to the goods and services citizens enjoy. However, productivity growth has been uneven and our relative performance has fluctuated, reflecting both domestic policy choices and external factors. Since the financial crisis, despite a strong recovery and an impressive job creation record, Britain has fallen further behind relative to our comparatively productive peers and has lost much of the ground caught up since the 1980s. The ONS estimates that UK output per hour is 17% below the G7 average, 27% below France, 28% below Germany and 31% below the US. In fact, in comparison with the US and Germany, Britain is now back where it was in 1992. We spent some time assessing the wide range of different explanations that have been given for the recent ‘productivity puzzle’ (and you can find a longer discussion of this in the plan itself). But what became very clear was that a plan which responded only to the immediate ‘puzzle’, would not be enough. The UK’s productivity weakness existed well before the financial crisis and the literature showed us that the greatest drivers of productivity were those that had both caused the long-standing gap in productivity and started to help us close it in the ‘80s and ‘90s – which meant we had to focus on the long-term fundamentals. Promoting a dynamic economy that encourages innovation and helps resources flow to their most productive use. Under each of these headings, we looked both at areas of strength that Britain needed to build on and preserve (like our strong science base) and identify our areas of long-standing actual or perceived weakness (like infrastructure). In many ways, the real challenge was not developing a methodological framework, but being prepared to take the radical steps necessary to break historic patterns of weakness. The Chancellor was critical to this – he was ready to think big, to work across Government and even to break some taboos. For example, there has been lively debate in the UK on hypothecation of tax. But the evidence on infrastructure investment told us how important the roads infrastructure is as an enabler of growth (car journeys represented 77% of distance travelled in the UK in 2013) and also highlighted historic underinvestment and weakness (the World Economic Forum ranks the UK 30th in the world for the quality of our road network, behind Namibia and Puerto Rico). One-off injections of cash will not be as effective as a long-term commitment to investment and so the Chancellor was prepared to hypothecate Vehicle Excise Duty (Road Tax) revenues in their entirety, promising to spend them all on the roads. The Chancellor, with the Prime Minister and the Secretary of State for Communities and Local Government, was also ready to take on the notoriously difficult political hot potato that is the planning system. The link between productivity and planning may not be immediately obvious, but the LSE Growth Commission and others have argued that the planning system is one of the most distorting features of the British economy and one of the greatest interferences in the flexibility of the labour market. People can’t choose where to work and assume they can find somewhere reasonably-priced to live near their job; they often end up choosing their job based on where they can afford to live. And the growth of our most productive places is directly – and severely – constrained by planning. So the move to a ‘zonal’ planning system for brownfield land (which effectively gives automatic planning permission for brownfield areas identified in local plans) and the new regime for ensuring every area has a good local plan for providing the housing that’s needed (with the threat that Government will step in if they do not) represents a shift not just for all those who aspire to own their own home but can’t, but also for anyone interested in UK productivity. The UK’s weaknesses in skills, particularly in technical skills and those most sought by employers, is almost axiomatic (without action, the UK is forecast to fall to 28th out of 33 OECD countries for intermediate skills by 2020). Training by employers themselves – which is clearly the most effective way to make sure the skills built are those employers really value - has fallen off a cliff. Once again, the Government took radical action and set out plans for an apprenticeship levy, which will both fund the commitment to 3 million apprenticeships and – crucially - make certain that larger employers have ‘skin in the game,’ and are incentivised to make sure the training is good-quality and relevant to real workplace skills and no longer have the option to simply not train their workforce. Finally – starting well before the publication of ‘Fixing the Foundations’ – the Chancellor has shown his commitment to tackling one of the biggest challenges of UK growth, that of re-balancing the economy. The Chancellor’s announcement of a historic deal with Manchester in the spring changed the political weather around devolution; and ‘Fixing the Foundations’ continues the work of building the Northern Powerhouse, with new devolved planning powers, a clear plan for Transport for the North and a route map to a further set of devolution deals alongside the Spending Review. Of course, the public sector represents around 20% of the economy and so improving our own productivity and efficiency makes a significant difference to the overall numbers, as well as benefitting taxpayers and those who use public services. There are grounds for optimism here. In the two years after 2010 (following a period of flat public sector productivity), the ONS estimates that productivity increased by 2.5% and 1.2% respectively, as service outputs increased, despite reduced budgets. Budget cuts don’t always lead to productivity gains and it’s hugely to the credit of policymakers and public servants everywhere that the reductions in spend have been well enough targeted and well enough managed that certain sections of the public sector have outperformed the private sector average in its productivity in recent years. It’s no surprise that public sector productivity will continue to feature as a key driver of the Spending Review that has just been launched. Will it work? And what next? Early views of the Productivity Plan from business stakeholders, such as the CBI, have been positive. But the proof of the pudding will be in the eating. And despite great cries of joy on the second floor of the Treasury when the first productivity figures since the plan showed a slight up-tick, it will be a slow burn. The next stage is to make sure that we implement the plan well, with a cross-Whitehall group to own and drive progress (given that the landscape of productivity is so wide and touches so much of what Government does). But we are also clear that we need to take a wider view of whose role it is to build British productivity – many of the things that can make the most difference are not for Government. After the plan was published, we received a letter picking up on a metaphor used in the annex. The metaphor was that productivity is like cooking – it depends both on the ingredients (long-term investment) and the recipe (a dynamic economy that uses the ingredients well). Our correspondent thought we should have said more about the cooks – the managers who run Britain’s biggest firms. And it’s true that one of the bits of analysis that came through our early work, but didn’t survive the late-night pruning of the plan was that the UK suffers from weakness in management skills compared to competitors. But there’s a real question about whether this is an issue best solved by Government. So to address this, and issues like it, some of the country’s most senior business leaders, led by Sir Charlie Mayfield, will be taking forward a business-led action group for productivity, focusing on practical steps to drive greater productivity in different sectors and workplaces across the UK – and we will be working with many others, including in groups convened by the CBI and the British Chambers of Commerce, to continue a wider conversation about productivity growth. ...the public sector represents around 20% of the economy, and so improving our own productivity and efficiency makes a significant difference to the overall numbers, as well as benefitting taxpayers, and those who use public services. Our aim is that ‘Fixing the Foundations’ will do what it says on the tin - lay the foundations of a truly ‘long-run’ economic plan. It has been the product of deep economic analysis, collaborative discussions across Whitehall and thoughtful engagement with academics and business leaders beyond, as well as of the boldness of this Government in tackling long-standing problems with radical solutions. It has the potential to deliver real change – not just higher living standards for us, but the all-important promise that our children’s prospects will be yet better than our own. Many of the measures in the plan will not bear fruit overnight. But, as the proverb says, the best time to plant a tree is ten years ago; the second-best time is now. Identifying a lag in productivity growth compared to two other nations on a graph merely provides a useful hook for policies the government is already ideologically committed to anyway. Just as many policies could be argued to be anti-productivity - cuts to NHS impacting on workers health for instance. In fact that is a far more obvious correlation - sick people can't make as many widgets per hour. It would be great to see some serious discussion of these isues from the government using the methodology that "high class science and innovation" people use: such as defining productivity accurately, categorically, objectively; putting in human terms a realistic appraisal of the benefits and sustainability of encouraging an increase in productivity growth, as opposed to other objectives - what the social and environmental benefits of increased productivity are and what the side effects are; researching what actually affects levels of productivity positively and negatively; lastly putting in place policies proven to generate sustainable levels of improvement in productivity growth regardless of ideology, popularity or political persuasion. But who has time for that? I cannot see that the changes to planning regulations create anything more than a temproary boost to the economy. I agree that in order for people to move nearer areas of work there has to be affordable housing but simply building more housing is not necessarily the answer. The ratio of cost of housing (either buying or renting) to family income has increased dramatially over the past 20 years and many people today simply cannot afford to rent or buy adequate housing. Rent caps and Bank of England intervention to curb the increases in the cost of housing has to be considered before our countryside becomes a flat expanse of concrete and indentikit housing estates. Stacey Collins, take a bow. Excellent critique of a bit of government propaganda there. Our productivity stalled in the 80's and we have been a service providing (propped up by an inflated London-centric housing market) economy ever since. This Government think we can get more for less but we cant. It is simple science. Money flows around in circles. If the UK didn’t allow any money to come in or leave the country then the government would only have to adjust tax levels to suit the amount of services it provides to the people. We would manufacture all the things we needed. If somebody then decided that we could buy £20 Billion worth of food and goods for £10 Billions per month (Sounds like a great deal) then we could all buy twice as much stuff and life would be wonderful. The problem is that the manufacturing base disappears and the £10 Billion leaves the country and never comes back. The only jobs in the country are low paid warehousing or retail. The Government receives less in tax revenue and has to plug the gap with £10 Billion in borrowing per month. I appreciate the UK economy is a bit more complicated than that but I believe that the principal of money flow is correct. I think the Government should concentrate on ways of reducing imports of selected categories of items, encouraging more UK manufacturing and encourage exporting of goods by reducing tax on exports or even subsidising them to some extent. In the real world this would balance money flow in and out of the country and hopefully more money would flow in than out allowing the government to pay off its debt. Please give Civil Servants proper pay rises and spine point increases rather than thinking this is a way to reduce the deficit – all this will do is give them less disposable income and therefore they can’t buy cheap imported goods. Surely the rapid growth in jobs versus the slow growth in productivity is simple: they aren't productive jobs in this sense. They are worthy jobs but they aren't manufacturing, they can't be measured. People are struggling to get a decent-paid, non-zero hours contract job because things aren't actually as bright as we're all told, so, to make ends meet, they have to go it alone as gardeners, handymen, window cleaners or catering staff. As I say, great jobs, that have to be done and are always necessary, but their output cannot be measured.